Sometimes when you walk across a small bridge in the middle of the city, there is this stench that follows you. What is this stench? Where is it coming from? What is underneath the bridge? Usually there’s a “nala”, a drain that was probably built to carry rain water outside the city, but is now filled with garbage and filth. But there is an exception, which is the Badshahpur Drain in Gurugram. It used to be filled with muck and was an eyesore. Today, the people of Gurugram have turned a drain into an eco-friendly zone, green zone, with no stench or garbage ruining the area. The Badshahpur Drain is a 28 km long and 30-40 meter wide and was the cause of many problems in the city. It cut across entire Gurugram and meets the Najafgarh drain in Delhi. The Badshahpur Drain is a storm water drain that was built 50-70 years ago. 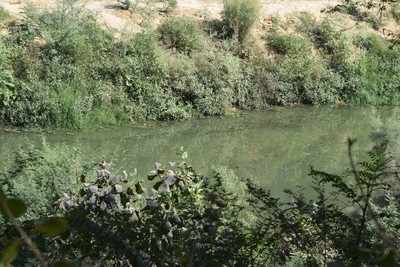 The water in the drain comes from the Aravali Hills. It was built to prevent floods. There was so much garbage in the drain that it did not allow water to flow through it causing water logging problems. In July 2017, the Haryana Urban Development Association (HUDA) decided that it was going to rehabilitate the drain. HUDA along with NGO ‘I Am Gurugram’, which was backed by corporate funding and the Municipal Corporation of Gurugram (MCG,) had planned to clean a 5.2 km stretch of the drain and turn it into an eco-friendly zone. Clearing 180 trucks of garbage! The first step was to take the plastic out of the drain. “It was a difficult task as the plastic had been lying there for 25 years,” said Latika Thakur, Chief of ‘I am Gurugram’ an NGO which works for the greenery of the city. “An astonishing 180 trucks worth of garbage was taken out from the drain,” Latika said. Considering that the average truck can carry up to 5.5 lakh pounds filth, a grand total of over 10 lakh pounds of garbage was taken out of the drain. “The cycle track constructed beside the drain will be very useful to many people as it cut across the city, providing short and safe route for pedestrians to travel. It will be very useful for walking and for school going children,” said Nandini Bishnoi a visitor to the eco-friendly park. After the garbage was taken out it was time for HUDA to utilize the recently cleaned area around the drain that was lying useless. HUDA along with MCG started building a cycle track and pedestrian walking path along the drain. “We have finished constructing 2.2 km of the cycle path and plan to extend it to 5.5 km,” Latika said. They have also planted trees all around the drain to make the area eco-friendly. And what’s more they used the malba from construction sites nearby to Nearly 10,000 saplings have been planted around the drain. “I could not believe that is was a nala, now there is hardly any garbage in it. I appreciate the efforts of Latika and her team, they have done a fantastic job,” said Daksh Gogia who had recently visited Badshahpur Drain for the first time. Drains are scattered all over India, spreading the same stench. Some of these drains used to be rivers but now they have turned into stinking drains because of continuous onslaught of garbage by the public and the government. A clear example of this is the Najafgarh Drain in Delhi& NCR that used to be Sahibi River but was turned into a drain because of continuous sewage dumping by the residents of Gurugram and Delhi. The drain accounts for 30 per cent of sewage found in the Delhi. The major problem with these drains is that they are located in the heart of Delhi, causing the whole area to stink. Due to extensive garbage dumping these drains have become breeding grounds for mosquitoes, and harbor other such disease-causing vectors. The government woke up from hibernation and has been trying to clean these drains for many years. There is so much garbage dumped in the nalas that a literal mountain can be formed .However, it is not an impossible task as Gurugram has proved. “The newly constructed cycle track is made out to reused road construction material thereby sharply decreasing the cost of the construction,” Latika said. The entire fencing of the drain has been done by the MCG. Children have started to use the cycle track to go the school, its gates are constructed in such a way that no motorcycle can pass through it, making it safe for children. The pedestrian path has a special surface that makes it possible for blind people to walk on it without losing their way. The cleaning of the drain is a noble gesture but there are some retractors of it. Some people are still dumping garbage in the drain while those who have illegally encroached on the drain refuse to let go. “The cycle path is facing some vandalism issues, where people are breaking gates and stealing overhead lights. However, all these are minor inconveniences towards a greater goal,” Latika said.